Synopsis: In the 1770s, young Barnabas Collins (Depp), the heir of a wealthy New England fishing company, breaks a witch's heart (Green). In turn the witch kills Barnabas' love, Josette, turns him into a vampire and locks him away in a coffin. 200 years later Barnabas is released and finds that his family estate is in shambles thanks to the same witch. He then makes it his mission to restore his family to it's former glory, defeat the witch, and maybe even fall in love with the family's governess, Victoria, who looks eerily similar to his former lover. Andrew: Hello readers! 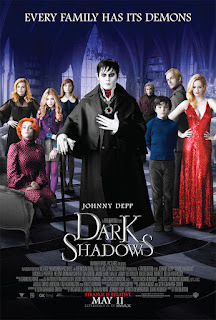 It’s a new movie Friday, as Sarah and I ran to the theatres late this afternoon to see the newest film from one of our favorite actors, Johnny Depp (Pirates of the Caribbean), in Tim Burton’s Dark Shadows! Sarah, Dark Shadows is the EIGHTH collaboration between Depp and Burton, and there have been a lot of mixed reviews of their most recent ones, most saying that the two need to probably take a break creatively. After seeing their latest film, what do you have to say about those critics? Sarah: My feelings are a little mixed on it. Whereas I believe that their creative well is starting to run a little dry, I think that what they do is very THEM. When you go to a Tim Burton/Johnny Depp movie, to expect anything other than that would be an unfair expectation. Whether or not that’s a good thing is debatable. As a director or actor you want to continually expand your craft , but these two seem pretty content sticking with what they know. A: So then applying that to Dark Shadows, and especially after Alice in Wonderland, is this one film too many? Or did you enjoy the movie for what it was? S: I enjoyed the movie for what it was! Even though they all seem to kind of fall along the same lines – not a ton of creative differences in their movies – it was still entertaining. It's definitely campy, but in my belief, that’s what they do, especially with movies like Dark Shadows and Alice in Wonderland. These movies are purely for entertainment, they’re not made necessarily to make you think. I would actually argue that Burton and Depp are two of the last filmmakers that don’t have a ton of an agenda. A: I agree with you, Dark Shadows was very entertaining and it was the kind of movie where you go to the theatre to BE entertained and escape the real world. Like many of Burton and Depp’s collaborations, it’s fantastical movie and it’s one where you can tell the people involved had a lot of fun making it. Now let’s talk specifics: what about the movie was so entertaining, or what did you enjoy the most? S: Well it was Johnny Depp playing Johnny Depp at his finest. A: So you don’t see it as a criticism to say that he was basically playing himself or a variation of a character that he’s played before? S: We have routinely berated other actors for playing themselves (see: our review of Safe) but with Johnny it’s different. It could be because I would drop you in a second if he came to our door, or it could be that I don’t feel like he takes himself too seriously. Again, going back to that they create their film for entertainment. S: It’s a funny movie! Now, not knowing much at all about the storyline it was kind of nice. I didn’t feel like I needed to compare it to anything that came previously. The cast, as we predicted, worked perfectly. And while it was a very strange movie, I had fun! A: Obviously I’m going to be a little biased because Johnny’s my boy, but I honestly thought this was a very solid movie. It was funny a lot of times (some great, quick comments including one about Chloe Grace Moretz's (Let Me In) Carolyn), it had a lot of horror film elements in it that I loved, and while it was a little all over the place at times, I feel that this movie isn’t as bad as the trailers, commercials or other reviews I’ve read have made it out to be. Yes, Johnny is basically playing a character he’s played before in other films (but this time he’s a vampire from the 1700s! ), but I don’t see that as a drawback. People go to Johnny Depp movies BECAUSE of characters like this – why else would Alice in Wonderland make over a billion dollars worldwide? S: I would agree with you. You know what kind of character you’re going to get, and true fans will go see this movie not for the story but to see him. That all being said, while I did love the elements of horror, it makes you jumpy without ever actually expecting horror, I do believe that the storyline was a little weak. I understand that there were over a thousand episodes of Dark Shadows the television series but I feel like it could have been condensed a little better. A: I will give you that. The story is the thing that’s all over the place, ranging from Barnabas being turned into a vampire, to his waking up in 1972 and being a fish out of water, to a love story, a revenge story, and then it finishes as this straight up monster movie. It’s weird and almost doesn’t know what it wants to be. But that brings me back to what we’ve been saying: it’s an entertaining movie. The fish out of water parts totally work and are funny, the first act of the movie is an excellent horror film (or at least have the makings of one), and the last act is a pretty good -looking action piece (save for a one instance of special effects I won’t say here). I'd actually say a lot of this film reminded me of Burton's Beetlejuice, but with better special effects. Before we end this, I briefly want to echo your earlier sentiment that the casting choices worked well, but I felt like some of the actors got short shrift. Like Michelle Pfeiffer (Batman Returns) didn’t have a whole lot to do other than repeatedly walk down the master staircase in dramatic fashion, and Johnny Lee Miller (Dexter) might as well not have even been in the film his character is so unimportant. S: Agreed. I think they should have promoted Gulliver McGrath’s David, the young boy, because next to Barnabas and Carolyn, he’s the most important member of the Collins family. Ok! Well I think we can agree on one thing for certain – it’s an entertaining movie to go see! A: Yeah, if you go into it expecting a masterpiece or some awesome new take on the vampire genre, you’ll be disappointed. Go into it expecting a Burton/Depp film and enjoy it for what it is. We certainly did. S: In the end we’d say it’s a good way to kill the afternoon!